Useful empty boxes for Unison Pastels also available. Unison Colour Handmade Soft Pastels are made in the Northumberland National Park. The business began in the early 1980s, when artist John Hersey found that mass produced, factory made pastels simply did not offer the qualities he was looking for. These wonderful soft pastels are the result of John Hersey's efforts. 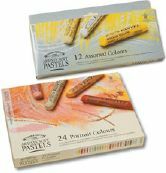 A huge range of soft artists pastels with high levels of pigment that create beautiful, rich colours. Fully blendable they produce stunning results every time. It took over three years at the end of the nineteenth century, to formulate the Sennelier range of Extra Soft Pastels a l'ecu. Although the range has evolved over the years the heart of the design remains unchanged. Manufactured with high quality, pure pigments finely ground with a natural binder and air dried for the perfect pastel. Conté à Paris Carres Crayons are incredibly popular with artists of all kinds. They have a 6x6mm cross-section and offer a range of 84 colours, 14 tones of which are specifically designed for sketching. 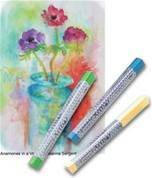 Caran D'Ache Neocolor II is a brilliantly innovative product - a watersoluble wax pastel. In 126 beautiful, vibrant colours. Used wet or dry these highly adaptable crayons can be used for a huge variety of effects. They have a very high pigment concentration making them very economical and are easy to smudge or scrape or spread with a paintbrush. Used wet they create beautifully dense colour washes and lovely soft effects. Winsor & Newton artists' soft pastels have been formulated to the highest standard to give you brighter, stronger, cleaner colours. Combined with a soft, creamy, supple, more uniform texture allows you to achieve maximum control of your pastels. 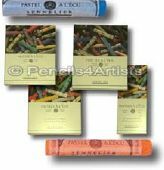 From Jakar International we have a great range of sets of good quality, non toxic pastels and compressed charcoals for beginners or younger artists. An excellent budget option.